Offerings of marionberry shakes, pies, tarts, ice creams, sorbets, salads, and more are ubiquitous on menus across the state of Oregon in July and August. Tables at farmers markets get covered with baskets of the shiny blue-black berries. Smart shoppers order flats of them to freeze and otherwise keep past the all-too-brief season. Marionberry season is serious business in the Pacific Northwest. The marionberry is the king and queen of blackberries. It has a complex and rich earthy flavor that skirts that edge of bitterness found in many blackberries. Many tasters find a similarity between marionberries and the rich, earthy juiciness of Cabernet grapes. It is sweeter and juicier than the Evergreen blackberries found in wild brambles up and down the West Coast, and although it's got some raspberry in its RNA (plant DNA), it's definitely not as sweet. It is a medium-sized blackberry that ranges in color from very dark red to true black. It is grown exclusively in Oregon, where it is prized above other blackberries. In Oregon, marionberries are always labeled as marionberries or their more formal name, Marion blackberries. This berry grows on trailing vines which have large spines. According to the Oregon Raspberry and Blackberry Commission (yes, there is such a thing), one acre of marionberry vines can harvest six tons of berries. Marionberries, especially the darker colored ones, are beautifully glossy. Look for bright, plump berries without blemishes, mold, or sogginess if you're lucky enough to find fresh marionberries for sale. Fresh marionberries are in season from mid-July to mid-August. Frozen marionberries are available year-round and work well in baked goods like this Blackberry Cobbler. They don't have a super short season, but it certainly isn't long enough for marionberry fans. You can make it last longer by buying or picking extra berries and freezing them to use later in the year. Luckily, freezing your own marionberries is easy: simply rinse and pat berries dry, spread them on a baking sheet and pop them in the freezer, after about an hour they should be frozen through and ready to transfer to a sealable plastic bag or other sealed container and kept in the freezer for months (find stand-alone directions for freezing berries). 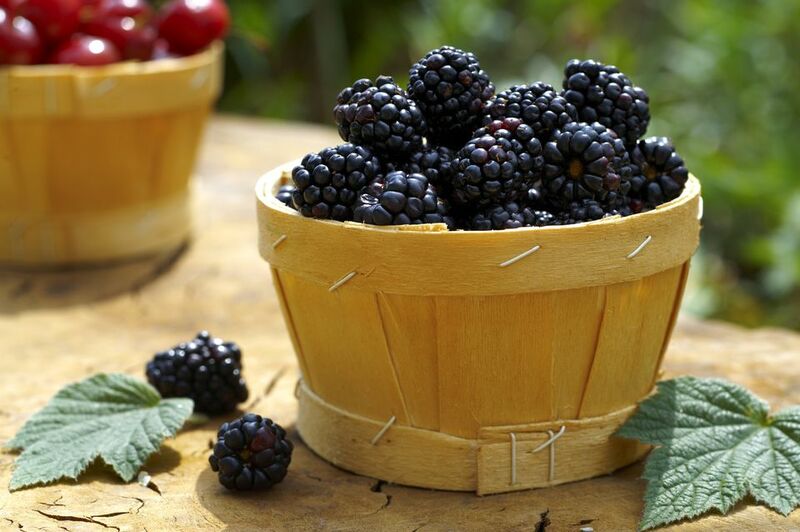 Like all blackberries, marionberries are high in antioxidants (vitamin C, gallic acid, and rutin in particular), as well as containing phytochemicals like ellagic acid and anthocyanins. Berries are also an excellent source of fiber: 1/2 cup of marionberries have as much fiber as 3/4 cup of brown rice. The marionberry was developed at Oregon State University in 1945 by crossing a Chehalem blackberry (a berry with native blackberry, Loganberry, and raspberry in its background) with an Olallieberry (itself a blackberry cross) and named after Marion County in Oregon. They were first brought to market in 1956. Marionberries are still held up as the blackberry to beat by berry breeders. Call Them Farmers Markets or Green Markets, but What ARE They?